We chose this cruise because we thought the Galveston departure would be the most convenient and that flights to Houston would be cheaper than flying to Florida. We are not veteran cruisers but have a little bit of experience having cruised with Royal to Alaska in 2007 and done a Mediterranean cruise with MSC in 2017. Embarkation was a little chaotic. WE arrived early so we could first on the ship but we needn&apos;t have done that. We arrived at 1030 and we were supposed to be boarding by 11 but it was well after 12 before we started moving. Needless to say the crowd in embarkation lounge was massive and they started boarding by loyalty class we were pretty late in the game before we were allowed into the line to start the long crawl onto the ship. The ship is so much bigger than anything we had been on and all of the activities available were just amazing. Three different waterslides, the surfing simulator and the rock wall will keep the young and young at heart busy for hours. The dining was good. We ate mostly in the Main dining room in the evening except for one night in which we did the specialty restaurant called chops. We enjoyed the MDR but felt it wasn&apos;t as good as we remembered from our 2007 cruise. The night at Chops was exceptional. A few of our lunches were in the MDR as well as we enjoyed each one of those. Breakfast, and a couple of lunches was in the Windjammer buffet. Again, we felt is wasn&apos;t as good as it was back in 07 but it was good enough for us. Both my wife and I really enjoyed the made to order omlettes and the ridiculous amount of bacon on offer each morning. The &apos;included&apos; juice was really a little substandard and thankfully I had a drink package that included real fresh squeezed OJ. Coffee was also mediocre but we were able to get great coffee down at Promenade Cafe so that made up for it. The show were a mixed bag for we enjoyed some and others no so much. 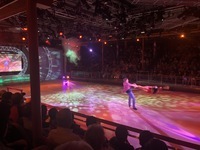 However, the ice show was utterly spectacular. I enjoyed it so much that I went and watched a repeat performance later in the week. 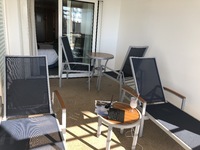 Our Aft balcony cabin was great. The balcony was massive and if you get a chance to get an aft balcony jump on it they are definitely worth it. All the staff that we encountered was were friendly and efficient and the waiter, asst. waiter in the MDR who served us each night and our cabin steward were fantastic! We did self-debarkation and felt like we were moving pretty fast until we got to customs and then everything slowed to a crawl. Luck of the draw would put us in the line that seemed to have the slowest CBP agent in history. I&apos;d give it an overall of 5 stars except we felt like food quality was slightly diminished since 07 cruise. Hence my 4 star rating. Otherwise everything was perfect and we had a great time and now have more cruises booked in our future. 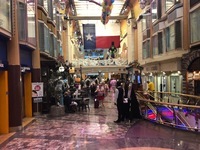 We chose this cruise because we thought the Galveston departure would be the most convenient and that flights to Houston would be cheaper than flying to Florida. We are not veteran cruisers but have a little bit of experience having cruised with Royal to Alaska in 2007 and done a Mediterranean cruise with MSC in 2017. Embarkation was a little chaotic. 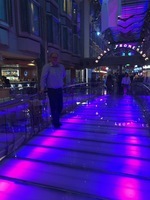 WE arrived early so we could first on the ship but we needn&apos;t have done that. We arrived at 1030 and we were supposed to be boarding by 11 but it was well after 12 before we started moving. Needless to say the crowd in embarkation lounge was massive and they started boarding by loyalty class we were pretty late in the game before we were allowed into the line to start the long crawl onto the ship. The ship is so much bigger than anything we had been on and all of the activities available were just amazing. Three different waterslides, the surfing simulator and the rock wall will keep the young and young at heart busy for hours. The dining was good. We ate mostly in the Main dining room in the evening except for one night in which we did the specialty restaurant called chops. We enjoyed the MDR but felt it wasn&apos;t as good as we remembered from our 2007 cruise. The night at Chops was exceptional. A few of our lunches were in the MDR as well as we enjoyed each one of those. Breakfast, and a couple of lunches was in the Windjammer buffet. Again, we felt is wasn&apos;t as good as it was back in 07 but it was good enough for us. Both my wife and I really enjoyed the made to order omlettes and the ridiculous amount of bacon on offer each morning. The &apos;included&apos; juice was really a little substandard and thankfully I had a drink package that included real fresh squeezed OJ. Coffee was also mediocre but we were able to get great coffee down at Promenade Cafe so that made up for it. The show were a mixed bag for we enjoyed some and others no so much. However, the ice show was utterly spectacular. I enjoyed it so much that I went and watched a repeat performance later in the week. Our Aft balcony cabin was great. The balcony was massive and if you get a chance to get an aft balcony jump on it they are definitely worth it. All the staff that we encountered was were friendly and efficient and the waiter, asst. waiter in the MDR who served us each night and our cabin steward were fantastic! We did self-debarkation and felt like we were moving pretty fast until we got to customs and then everything slowed to a crawl. Luck of the draw would put us in the line that seemed to have the slowest CBP agent in history. 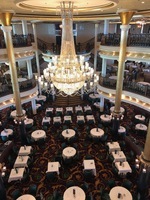 I&apos;d give it an overall of 5 stars except we felt like food quality was slightly diminished since 07 cruise. Hence my 4 star rating. Otherwise everything was perfect and we had a great time and now have more cruises booked in our future. Typical Spacious view balcony until you stepped outside. 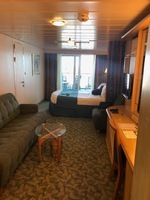 Balcony is huge on an aft balcony stateroom. Galveston was Ok. The downtown pedestrian area is littler with little t-shirt shops and other clitchy stuff that don&apos;t really present good value for shopping. The weather was unfortunate but they did their best and offered free drinks and a little beach time after it was all over.